Eunice Kennedy Shriver founded Special Olympics on the belief that individuals with intellectual disabilities could participate and excel in a variety of sports thereby improving their quality of life and that of their family members. Today, Special Olympics is the largest program in the world for individuals with intellectual disabilities with programs for 4 million athletes in over 180 countries and all 50 states. A Kansas delegation of 6 athletes from Holy Family Center in Wichita, coached by Chuck Watson and Charles Meyer, attended the first Special Olympics Summer Games at Soldier Field, Chicago in 1968. Since then, Special Olympics Kansas has grown providing a quality, year-round program of athletic training, health education and competition opportunities to more than 5,400 athletes with intellectual disabilities throughout the state of Kansas. Participants train daily in one or more of 20 sport offerings, and competitions are held at multiple locations throughout the state. In addition, Special Olympics Kansas continues to implement innovative programs to assist in those areas of service which are lacking to participants. Through Unified Sports©, Healthy Athletes® Programs, Athlete Leadership Programs, and Young Athletes®, Special Olympics Kansas continues to develop and promote programs that help our athletes improve their health and fitness, acquire new skills, develop lifelong friendships, and encourage widespread community understanding and acceptance. Everyday, athletes gain more than just a chance to play a game or run a race; they gain the opportunity to become a role model, a teacher, a friend and an inspiration. For the athletes of Special Olympics Kansas, the training never stops and the benefits last a lifetime. June 1962 – Eunice Kennedy Shriver started a summer camp for children and adults with intellectual disabilities at her home in Maryland based on the belief that they were far more capable in sports and physical activities than many experts believed. July 1968 – The First International Special Olympics Summer Games was held at Soldier Field in Chicago, Illinois. Over 1,000 individuals from 26 U.S. states and Canada participated in track and field events. A delegation of 6 students from Wichita competed and were the forerunners of Special Olympics Kansas. May 1970 – The first Kansas Special Olympics was held at Parsons State Hospital and Training Center with 300 participants. 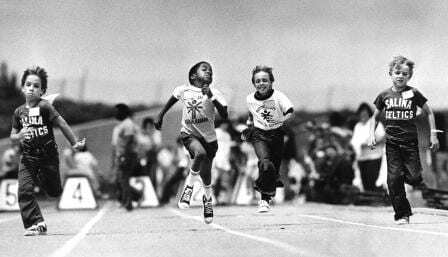 December 1971 – The U.S. Olympic committee gives Special Olympics official approval as one of only two organizations authorized to use the name “Olympics” in the United States. February 1977 – Steamboat Springs, Colorado hosts the first International Special Olympics Winter Games with more than 550 athletes competing in skiing and skating events. Kansas was well represented having the second largest contingent exceeded only by Colorado. July 1979 – As a result of tremendous growth, it was decided that Special Olympics Kansas could, and should, stand alone and the organization was incorporated as a non-profit 501(c)(3) organization. 1981 – The Law Enforcement Torch Run (LETR) is launched in Wichita, Kansas where Police Chief Richard LaMunyon saw an urgent need to raise funds for, and increase awareness of, Special Olympics. The LETR is now the movement’s largest grass roots fund raiser, raising over $30 million annually. 1983 – Eunice Kennedy Shriver, President of Special Olympics, Inc., attended the SOKS Summer Games in Wichita with over 1,600 athletes. 1986 – The first sports camp was held at the University of Kansas marking the beginning of a partnership with the Big-12. Coaching staff from the university provided workshops in 6 different sports to 175 athletes and coaches. February 1988 – The International Olympic Committee (IOC) signs an historic agreement with Sargent and Eunice Kennedy Shriver, in which the IOC officially endorses and recognizes Special Olympics. July 1988 – Special Olympics Unified Sports® is launched, bowling, volleyball and softball are the first sports to be included. January 1997 – After its debut at the Special Olympics World Summer Games in 1995, Healthy Athletes® becomes an official Special Olympics initiative, providing health-care services to Special Olympics athletes worldwide. October 2001 – Special Olympics develops and distributes “SO Get Into It™ kits for students with and without intellectual disabilities to schools and teachers at no cost. The kit teaches young people about intellectual disabilities while empowering them to be the difference by learning the values of inclusion, acceptance and respect. June 2003 – Ireland hosts the first Special Olympics World Summer Games to be held outside the U.S.
October 2004 – President George W. Bush signs the “Special Olympics Sport and Empowerment Act,” marking the first time that Special Olympics secures support through legislation. December 2005 – “The Ringer” opens in theatres throughout the U.S. and Canada; with appearances from over 150 athletes it challenges destructive stereotypes and negative thinking about people with intellectual disabilities and kicks off the introduction of Project Unify. July 2008 – Special Olympics celebrates its 40th anniversary with almost 3 million athletes in more than 180 countries worldwide. 2009 – Special Olympics Kansas introduced the Young Athletes® program in the Metro Area introducing 105 young children, ages 3-7 with intellectual disabilities, to the world of sports. August 2009 – Eunice Kennedy Shriver dies at her home in Massachusetts. June 2010 – Special Olympics Kansas celebrated 40 Years of service at the State Summer Games in Wichita, Kansas. The first Special Olympics Global Congress is held in Morocco.